Kelsey grew up in the Seattle area and nurtured her love for cities (and walking, biking and transit) while living in the urban jungle of Chicago. 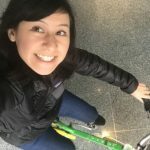 Grounded in theories of public health and cultural anthropology, she sees urban policy and planning as a means to building healthier, more socially connected communities and puts this into practice daily as an active transportation advocate. Kelsey lives in Colombia City, less than a mile from her childhood home, with her husband, dog and many bicycles.